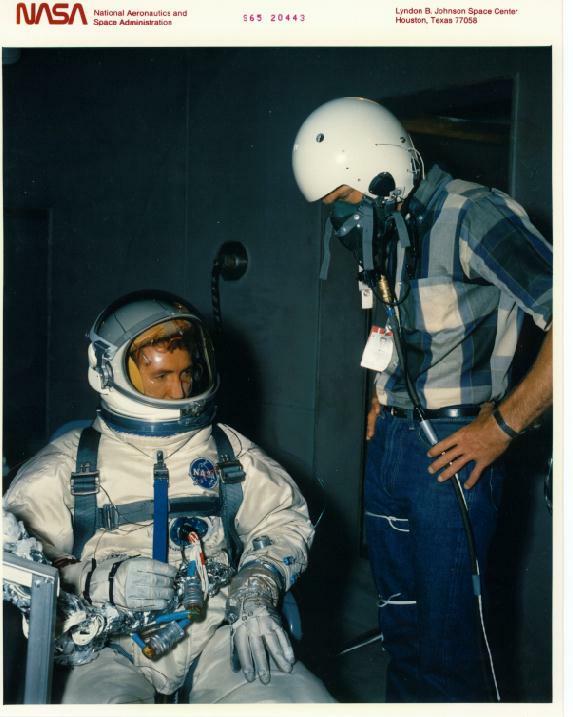 I was a volunteer test subject for the Gemini EVA spacesuit test before Ed White's EVA. The test was conducted at conditions equal to the cold vacuum of space. In 1965 the space race was still hot. The USSR had performed the first manned EVA. NASA was working on a space suit and life support system to allow a U.S. EVA as quickly as possible. This test at 'hard' vacuum and -300 degree F was intended as a visor fogging evaluation. Details to follow. We were young then; in our 20's and 30's. Most were recent graduates of universities from the hills of Arkansas to the bayous of Louisiana and from the prairies of Texas to the mountains of the Virginias and Pennsylvania. During the previous space flights the space suit served as a backup to the spacecraft; that is, if the spacecraft lost pressure, the suit would be able to hold pressure until re-entry. The spacecraft provided protection from the cold of space and the heat of the sun. The suits would have to provide thermal protection for a crewman to be able to leave the spacecraft. 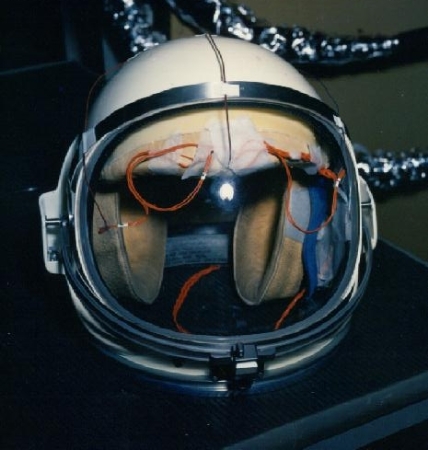 The overall objective was to show that the Gemini suit would maintain an acceptable temperature when exposed to about -300 degress F. A specific objective was to show that the inside of the helmet visor would not get so cold that it would fog enough from the crewman's breath that vision would be reduced. Two visors were to be evaluated. This is the instrumented test article. Thermocouple temperature sensing devices are attached the to exterior and thermistor temperature sensing devices are attached to the inner surfaces. The different devices are chosen for technical reasons. Two helmets were prepared for the test: one with a Plexiglas visor and one with the new Lexan plastic visor. Foam pads and the communications system earphones are visible inside the helmet. The visor can be rotated open. The inside of the visor was coated with a special anti-fog solution. When the visor is in place and the helmet system is pressurized, a pressurized rubber seal seals the area between the visor and helmet to eliminate leakage. The helmets also had a sun shield which could be rotated down to protect the eyes, but the sun shield wasn't needed in this test. The test was not for exposure to the sun (we weren�t ready to do that yet), but for the cold shaded areas where the sunshade might be up. This is not an official NASA Website (or unofficial site either for that matter). The comments and opinions are my own. PAGE THREE - A scan of the NASA photo of me that appeared in the April 19, 1965 issue of Missiles and Rockets. My photo of the closed-circuit television view of Ed White during his vacuum chamber training for GTS-4. The test results are summarized and I describe what being in a spacesuit at thermal-vacuum conditions was like for me. My photos of the 56-day vacuum test with Bob Crippen, Karol Bobko, and Dr. Bill Thornton. Features Jessica Savitch on the news team that reported the chamber entry and presidential candidate George McGovern who visited during the test. First US Woman EVA - My experience during Kathy Sullivan's training for this major event in space exploration history.